Everyone has a boss, but not everyone has a pastor. There are far more businesses than there are churches, which means that business leaders play a critical role in God's work throughout the world. 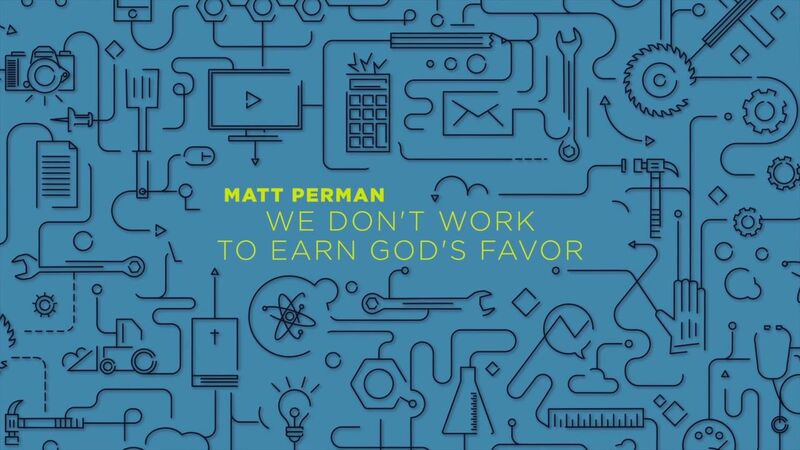 In this 29-minute session from the 2015 Work as Worship Conference, Matt Perman shares why work matters in itself and how the freedom of the gospel transforms its significance in life today. Matt Perman is the Co-Founder and Strategy Consultant for WhatsBestNext.com, a ministry devoted to resourcing Christians in their workplace. He also serves as Communications Director for the Made to Flourish pastors' network. Matt writes and speaks about leadership, productivity, and the world of work from a gospel-centered perspective. He is the author of What's Best Next: How the Gospel Transforms the Way You Get Things Done and How to Create a Business Plan that Actually Works. Listen as Matt demonstrates the power of doctrine on the way we view our work. Matt began his talk saying, "In order for our work to have the effect God intends for it to have, we need to do our work in a gospel-centered way." Work is deeply influential. It touches everyone's life in one way or another and God uses it significantly to transform the world. The doctrine of creation shows that work is not merely a platform for evangelism, but that it matters in and of itself because it reflects God's sustaining mercies of creating and providing for the world. What are some of the ways you see significance in your work? Are there any barriers that keep you from seeing your work as significant? Matt shared that if work is to transform culture, it must serve culture rather than domineer it. How do you see service reflected in your workplace? Why do you think this is such a compelling attribute to the world? While everyone works, the gospel transforms work in the life of Christians to uniquely influence where He has placed them. Because of the death and resurrection of Jesus, Christians do not work to earn God's favor. Rather, we work out of the favor we have in Christ. In other words, a gospel-centered perspective begins with doctrine, not practice. What connection do you see between doctrine and practice in your own life? Identify some of the ways your beliefs have influenced your actions in the workplace. In order to work in a gospel-centered way, Matt shared that it must start with a right understanding of justification. How would you define justification? How does the way you carry out your work reflect this definition? Focusing on behavior alone, while practical, ends up confusing Christianity. As Matt said, our first need as Christians is not to be more ethical people, but to experience the transformative power of forgiveness. We must embrace the ways in which we have failed to live up to God's standard in order to encounter the mercy of His grace. 4But God, being rich in mercy, because of the great love with which he loved us,5even when we were dead in our trespasses, made us alive together with Christ— by grace you have been saved—6and raised us up with him and seated us with him in the heavenly places in Christ Jesus,7so that in the coming ages he might show the immeasurable riches of his grace in kindness toward us in Christ Jesus.8For by grace you have been saved through faith. And this is not your own doing; it is the gift of God,9 not a result of works, so that no one may boast.10For we are his workmanship, created in Christ Jesus for good works, which God prepared beforehand, that we should walk in them. To be justified is to be made right with God. According to this passage, how does that occur? What is the basis for Christian justification? As Matt pointed out, both good and bad works are excluded from justification, but according to verse 10, salvation leads us into good works that God has prepared for us. What is the basic motivation for these works as described in verses 4–9? As you reflect on your own life, what are some of the good works that has God has prepared for you? What are some ways that you may have misunderstood the impact of justification on your work? How can you begin praying through these over the next week? 1. Justification enables you to work as worship. 2. Justification frees you from the need to work for the acceptance of others. 3. Justification enables you to love others without expectation. These are the fruits of a life transformed by God's forgiveness and are available to all through faith in Jesus Christ. We misunderstand justification when we believe that our work deserves God's approval. Matt pointed out that work truly becomes worship when we offer it to God out of gratitude for what He has done for us in Christ. In what ways do you view your work as an offering of worship to God? What are some of the obstacles that tempt you towards believing your work deserves praise from God? Throughout his ministry, Jesus regularly confronted the Pharisees over working for the acknowledgment of others. The doctrine of justification teaches us that, in Christ, God is pleased with our work, which frees us to do good for others because our significance does not depend on them. Who specifically can you serve this week in light of the freedom you have in Christ? In Matt's final point, he showed how the doctrine of justification enables us to truly love others. Because our salvation is not dependent upon our works, we can exhibit authentic concern for others since our security lies in the work of Christ. As you think about the people in your life, who do you know that is in need? How can you help to meet their needs whether or not it makes you look good? Matt said, "Doctrine causes the joy that empowers obedience." The doctrine of justification is not merely a concept to think about. Rather, in Christ, it becomes the freedom for worshipful work and the motivation for glad obedience. Good practice is always grounded in sound theology. Dwell richly on what God has accomplished for you in Christ and let the truth transform your work today. For more information on the Work as Worship Conference or how to attend next year's event, visit www.workasworshipconference.org.